Black can live with a play at the point 1, a or b.
HolIgor: Since beginners don't reply for a long time, I will give my solution. I don't see how White kills unconditionally. 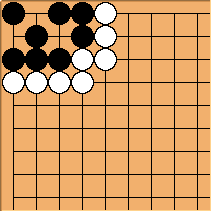 It is a ko (worth 16 points, which is 8 points miai counting). After White 1, Black has no choice but to play 2 threatening to kill the invader and live. 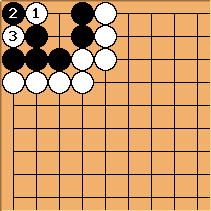 White captures 3 and now Black has to find a ko threat to prevent White from direct capture. The ko is quite large but... a note not for beginners. 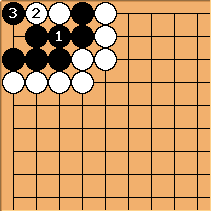 Black 1 is worth 12 points and no ko involved. So, White should not try to kill too early in the game. 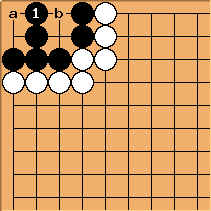 If White plays 1 and 3 in the diagram above she still has to spend a move to complete the capture, while Black can simply make ordinary middle game moves not worrying about that corner too much. It is bad for Black to spend ko-threats for such a small profit. But in the early yose this ko becomes large enough. Bill: The ko is a medium sized yose. Early yose plays are typically larger. In addition, the author has mixed deiri and miai counting. If you want to know how much a play gains, use miai counting. is worth around 6 1/2 points by miai counting, maybe a little more. (It depends on the surroundings, and kos are involved.) Since taking or winning the ko is worth 6 1/3 points, it is slightly bigger. Bill: It is easy to count the ko by area counting, since the region is fully enclosed. 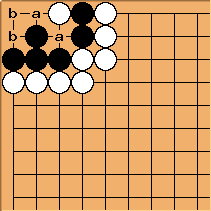 If Black wins the ko the result is 11 points. If White wins it, the result is -11 points (from Black's point of view). The difference is 22 points. 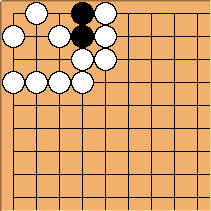 It takes Black 1 move to win the ko. 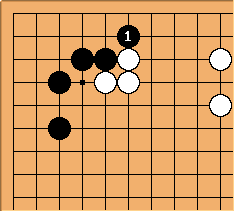 It takes White 2 moves to take the ko (one move) and then win it (another move). So 3 moves make a difference of 22 points, and each one is worth 22/3, or 7 1/3 points. Since there are no sekis involved, we can convert to territory counting by subtracting 1 point. (When a stone is played, it counts under area scoring but not under territory scoring.) That gives a value of 6 1/3 points. MateE : I don't get the counting. difference = 19 points Where is my mistake ? Anonymous: No mistake. 19/3 = 6 1/3, the same 6 1/3 that Bill gave for territory scoring. He was using area scoring in the explanation above (because it's must faster to see the totals). Doesn't this kill black. If black is alive after exchange "a" then "b" exchange kills. No, if black connects at 1 he lives no matter what.